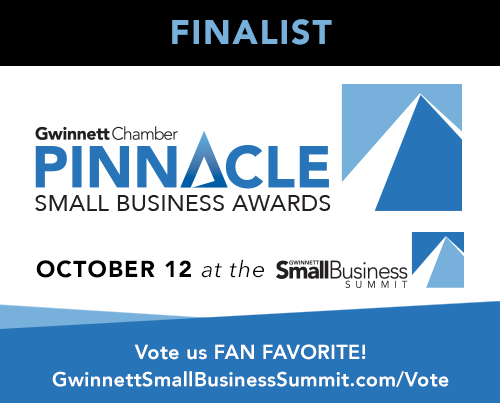 I am so excited to announce that we've been selected as a finalist in the small business 0-5 employee category for the Gwinnett Chamber's Small Pinnacle Awards! Among the Gwinnett Chamber’s most prestigious honors, the Pinnacle Small Business Awards pays tribute to leading small businesses that dare to start, strive to sustain and persevere to succeed. The Gwinnett Chamber application committee measures each applicant in the manner in which we demonstrate good business practices, customer service, and a commitment to growth and development. We must demonstrate a commitment to staff development and have helped to enhance our employees value and quality of life. It must be clear that we are dedicated to supporting local merchants and exhibit efforts to strengthen the community as a whole. The application consists of numerous essay questions touching on these various aspects of measurement. Pinnacle Award Winners will be announced on Thursday, October 12, 2017 at the Gwinnett Small Business Summit at the Infinite Energy Forum. Through September 29, 2017 voting is open to vote for your fan favorite. Can we count on your vote? Do you want the best auto repair near Buford? We are the only ASE Blue Seal Recognized shop in a 25 mile radius and we are proud of our ASE certified mechanics. We provide stellar customer service paired with exemplary skills maintaining all makes and models of your cars and trucks up to 14k pounds. We excel with engine and electrical diagnostics while taking care of your maintenance needs such as brakes, alignments, tire rotation, oil change, code scans, suspension and so much more! We thank you all so much for your business and support!